On Thursday’s “Hannity” on the Fox News Channel, Sen. Rand Paul (R-KY) explained to host Sean Hannity how he saw the unfolding turmoil in Iraq and how it became this unstable, to which he partially blamed on Iraqi Prime Minister Nouri al-Maliki’s resistance to having U.S. troops in his country. Paul said that before further action is taken by the United States, including air strikes, which he called a form of war, authorization from Congress is required by the Constitution and therefore such authorization should be sought. PAUL: It is hard for me to imagine American soldiers fighting alongside Iranian soldiers in Iraq. PAUL: I can’t fathom that. HANNITY: That’s John Kerry madness, in my view. Here’s the question. 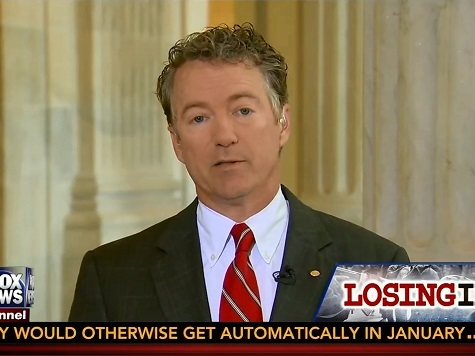 If Rand Paul were president of the United States, what would Rand Paul do right now? Would you allow air strikes? Would you send in soldiers? The president said today 300 people, et cetera. Would you support that? PAUL: I would follow the Constitution, and the Constitution says that Congress should vote on going to war, and that there should be congressional authorization. HANNITY: What would you want? HANNITY: … agree with that, too. PAUL: … of the American people. HANNITY: What would you want to do, though? HANNITY: What would you ask for if you were president? PAUL: … fighting alongside Iranian troops. HANNITY: Air strikes? Air strikes? PAUL: … and that Congress should vote on it because that’s what the Constitution says.